Anita Jo Intenzo-Haunted Author: THE CURSE OF KING TUT-IS IT REAL? THE CURSE OF KING TUT-IS IT REAL? In honor of the 92nd anniversary of the discovery of King Tut's Tomb coming up this week (November 22, 1922)- I would like to write about one of my all time favorite subjects- King Tut. 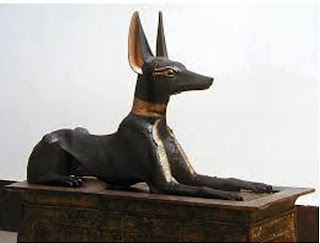 I have been fascinated by ancient Egyptian history since I was 8 years old. I first read about King Tutankhamen and the the discovery of his fabulous treasure when I was in the 6th grade and I was hooked!!! I even made a miniature temple of Karnak for our elementary history class and spent a whole weekend making columns out of beige card-stock and drawing and painting tomb scenes on each of its twelve columns -yes I admit I am a GEEK and proud of it! I've been fortunate in the last 30 years to see the traveling exhibits of King Tut's tomb treasures both times when they were here in the United States. First at the National Museum in Washington D.C. in 1976 (waited 5 hours in line as it was free admission!) and then at the Franklin Institute in Philadelphia 2006 (timed tickets-no wait!). It so happens that I've discovered that I am only 3 degrees of separation from the study of ancient Egypt and King Tut. During the last 30 years I became friends with Paul* who is the deceased friend and subject of my book, Estate of Horror. Paul was an anthropologist and often went to workshops at the University of Pennsylvania Museum in Philadelphia, Pennsylvania. There he met and became friendly with Zahi Hawass, (who was a graduate of U of P) and who until recently was the head of the Supreme High Council of Antiquities in Egypt and excavated many of the most important finds of mummies and their tombs in the last 25 years. The whole story of how archaeologist Howard Carter labored in the Valley of the Kings for almost 11 years and then discovering the tomb at the very last season of his digging, as his funding by Lord Carnarvon of England were running out, is an intriguing one. It was a fantastic discovery, like right out of a movie , that for a time I seriously considered being an archaeologist before becoming a professional artist. I am what they call an "armchair" archaeologist. 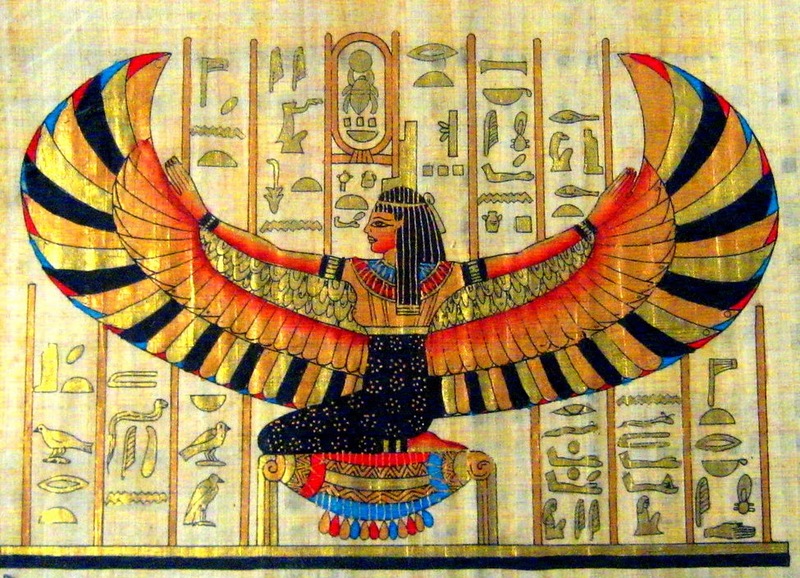 If there was a book or TV show on ancient Egypt or King Tut- I've probably read or watched it. My son calls me a walking encyclopedia on King Tut -just ask him and our friends who went with me to the 2006 exhibit and they will recall with amusement how we actually had people following us listening to my explanations about the items we saw-they thought I was one of the exhibit guides! And as a side note: Not a scarab, scorpion or mummy came after us while at the show. I also have a second degree of separation due to my History Professor I had when I was an art student at Moore College of Art and Design. My professor happened to have an uncle who was one of Howard Carter's young research assistants and when we were studying ancient Egypt, our professor of History, Mr. Wicks, told us this story: One night his uncle was in the tomb alone cataloging some of the many thousands of artifacts found in Tut's intact tomb and did his research by gas lamps and torches. It was late in the Valley of the Kings, very still and as"silent as a tomb" (forgive the pun). All of a sudden something caught his eye and as he turned around he swore one of the 6 ft. "Guardian Sentinels" in the tomb had moved! Combined with other strange occurrences he experienced in the tomb that night he swore he would never work in the tomb alone again! Curse of the Mummy: How did the curse legend get started? The curse of the pharaohs dates back centuries and refers to an alleged curse believed by some to be cast upon any person who disturbs the mummy of an Ancient Egyptian person, especially a pharaoh. This curse, which does not differentiate between thieves and archaeologists, allegedly can cause bad luck, illness or death. There had been stories of curses going back to the 19th century, but they multiplied after Howard Carter's discovery of the Tomb of Tutankhamen. Despite popular misconceptions no curse was actually found inscribed in the Pharaoh's tomb. The belief in a curse was brought to many people's attention due to strange occurrences and the sometimes mysterious deaths of a few members of Howard Carter's team and other prominent visitors to the tomb shortly thereafter. One incident and this is backed up by fact, was that Howard Carter sent a messenger on an errand to his house. On approaching his home he thought he heard a "faint, almost human cry". On reaching the entrance he saw the bird cage occupied by a cobra, the symbol of Egyptian monarchy. Carter's canary had died in its mouth and this fueled local rumors of a curse. 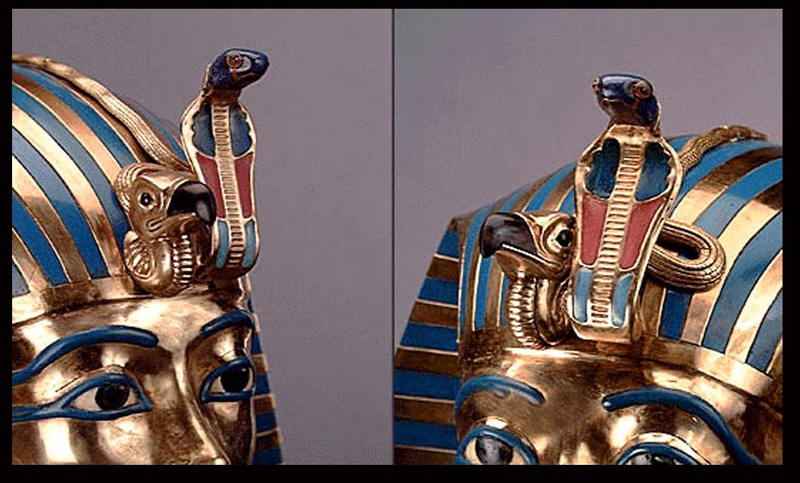 This was interpreted as Carter's house being broken into by the Royal Cobra, the same worn on the King's head to strike enemies, on the very day the King's tomb was (being broken) opened. An account of the incident was reported by the New York Times on 22 December 1922. The Royal Cobra (Uraeus), representing the protector goddess Wadjet, atop the mask of Tutankhamun. The death of Lord Carnarvon, Carter's benefactor who financed his dig, only six weeks after the opening of Tutankhamun's tomb resulted in many curse stories in the press. It seems Lord Carnarvon had been bitten by a mosquito as he exited the tomb one day, and later slashed the bite accidentally while shaving. It became infected and blood poisoning resulted. Two weeks before Carnarvon died rumors circulated to assert that "dire punishment" would follow any intrusion into a sealed tomb. A media frenzy followed, with reports that a curse had been found in the King's tomb, though this was untrue. Sir Arthur Conan Doyle, creator of Sherlock Holmes, suggested that Lord Carnarvon's death had been caused by "elementals" created by Tutankhamun's priests to guard the royal tomb, and this further fueled the media interest. Arthur Weigall reported that six weeks before Carnarvon's death, he had watched the Earl laughing and joking as he entered the King's tomb and said to a nearby reporter (H. V. Morton), "I give him six weeks to live." 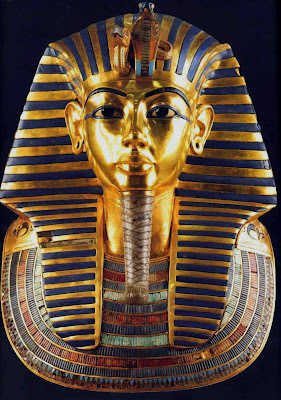 The first autopsy carried out on the body of Tutankhamun found a healed lesion on the left cheek, and some thought it the same place where Carnarvon had been bitten but since the Earl was buried six months previously it was not possible to determine if the location of the wound on the King corresponded with the fatal mosquito bite on Carnarvon. There have been modern discoveries to explain the real facts behind this "curse". Air samples taken from inside an unopened sarcophagus through a drilled hole showed high levels of ammonia, formaldehyde and hydrogen sulfide; these gases are all toxic. Hydrogen sulfide is detectable at low concentrations (Up to 100PPM) beyond which it acts as a nerve agent on the olfactory senses. At 1000ppm it will kill with a single inhalation. Recent discoveries show that stones used to build Egyptian tombs often contain uranium, a radioactive metal which decays, producing radon, a radioactive gas that can cause lung cancer and other respiratory conditions matching some of the symptoms described for those who died soon after opening the tomb. 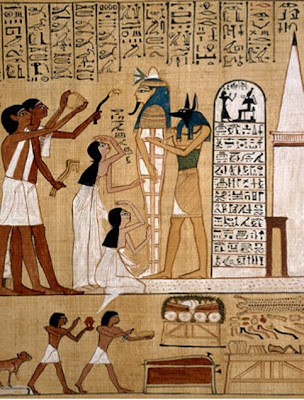 Recent studies of newly opened ancient Egyptian tombs that had not been exposed to modern contaminants found pathogenic bacteria of the Staphylococcus and Pseudomonas genera, and the molds Aspergillus niger and Aspergillus flavus. However, at the concentrations typically found, these pathogens are generally only dangerous to persons with weakened immune systems. While there is no evidence that such pathogens killed Lord Carnarvon, there is no doubt that dangerous materials can accumulate in old tombs. Interestingly, at the moment of Lord Carnarvon death in Egypt, there was a sudden blackout of all the lights in the entire city of Cairo which no one has been ever able to explain. Also back at his ancestral castle/home in England, Lord Carvaron's favorite hunting dog, gave a howl and dropped dead at the exact time of his master's death. More victims of the mummy's curse? "Death shall come on swift wings to him who disturbs the peace of the King". (a phrase which does not actually appear among the hieroglyphs in Tut's tomb even though it was said to appear in several different places). Howard Carter was entirely skeptical of such curses. He did report in his diary a "strange" account when he saw jackals of the same type as Anubis, the guardian of the dead, for the first time in over thirty-five years of working in the desert. Whether you believe in ancient curses or not there is one last coincidence that amazed me that I think you all will find interesting. 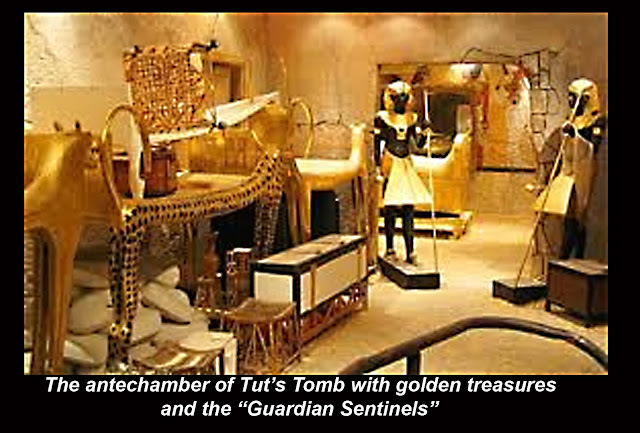 It seems not all the treasures from King Tut's made made it to the Cairo Museum. 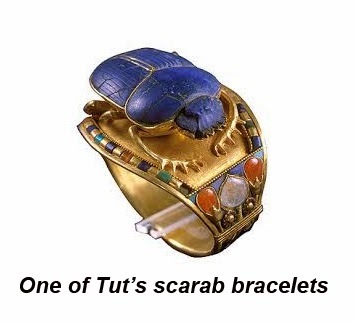 It seems Howard Carter and Lord Carnarvon took a few "trinkets" for themselves as souvenirs. 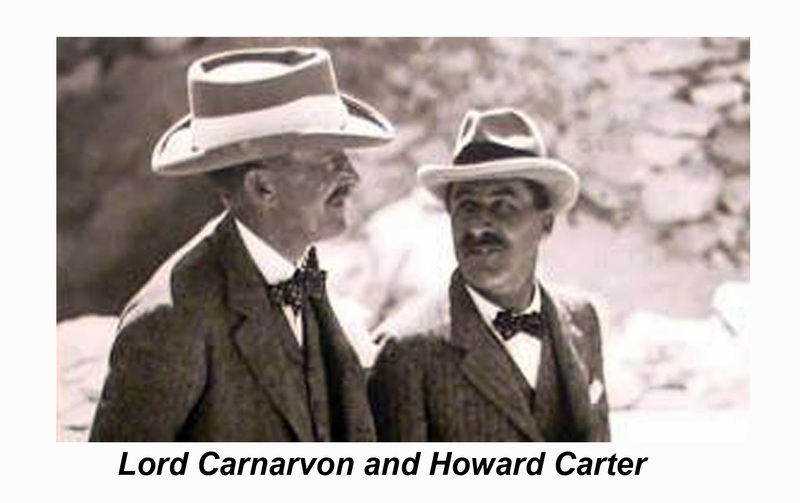 Well, we know how Lord Carnarvon ended up and Howard Carter for all his success and acclaimed apparently ended up penniless and died of lymphoma a decade later on 2 March 1939; however, some have still attributed his death to the "curse". It was said that Carter was so destitute in his later years that he was forced to sell some of his precious Tut "trinkets"and reportedly sold something to the U.S.Ambassador to England, who at the time was Joseph Kennedy, Sr., father of President John F. Kennedy. As we all know John Kennedy was assassinated on November 22, 1963, the same day the tomb of King Tutankhamen was opened 41 years before. Did the ancient curse of King Tut again claim its revenge? Next week more on King Tut and how he was doomed at birth!